Penetrating Flexible Polymer Coating (PFPC) is a proprietary blend of acrylate in an aqueous dispersion, which readiy penetrates deeply into concrete and once absorbed, becomes part of the internal structure of the concrete’s substructure; it also protects the surface by providing a protective opaque flexible polymer film coating which durably and tenaciously adheres to the treated concrete’s surface after drying. Penetrating Flexible Polymer Coating (PFPC) chemically provides a deep subsurface water / moisture barrier, which at the same time provides a flexible vapor-barrier coating on the surface. The simultaneous action of these two barriers combined, quickly and easily lowers concrete’s water vapor rate emissions. Penetrating Flexible Polymer Coating (PFPC) is excellent as a single application stand-alone product, when used as a vapor reduction treatment for concrete slabs / floors of 8 pounds of moisture vapor emissions per 24 hours per 1000 square feet, or less, as measured by ADTM F-1869 calcium chloride test, a single application will usually lower the emission rate from 8 pounds to 3 or below within 48 hours or less. 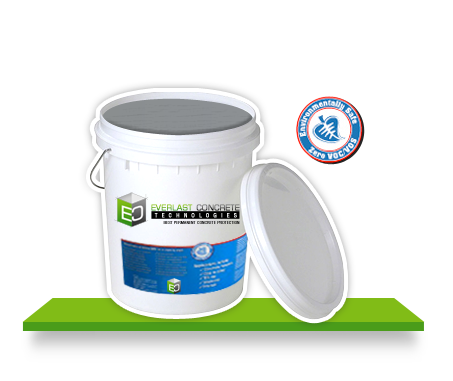 By reducing the levels of moisture and alkalinity Penetrating Flexible Polymer Coating (PFPC) provides additional protection helping to ensure the performance of any flooring material installed. Note : where emission rates are higher than 8 pounds an application of Penetrating Flexible Polymer Coating (PFPC) is recommended. Penetrating Flexible Polymer Coating (PFPC) liquid must not be allowed to dry on glass or contact shiny aluminum and should be removed with water prior to drying. Once dried, Penetrating Flexible Polymer Coating (PFPC) is extremely difficult to remove from the surface. Incidental contact of Penetrating Flexible Polymer Coating (PFPC) with the skin is not dangerous or hazardous, however protective clothing is recommended. For more information read material safety data sheet.